Henry Ford is one of the best examples of a self-made man. Talented inventor, brilliant manager and industrialist, whose business was one of the most profitable and successful in his time. His way was a way of development. He urged never to stop, always believe in one’s ideas and search for improvements in everything. A common farmer’s son in his past and a rich and famous person at the end, he was an example of a good businessmen in every meaning of this word and his secrets and principles are still alive and applicable to modern world. 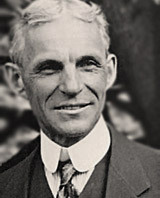 Henry Ford is one of the most famous American citizens and innovators. From his childhood times, which he spent on his father’s farm, to his last days, he was full of interest to life and energy to improve it. Learn more from Henry Ford's biography. “What I am trying to emphasize is that the ordinary way of doing business is not the best way. I am coming to the point of my entire departure from the ordinary methods. From this point dates the extraordinary success of the company.” – said Henry Ford about his way of doing business. His input into principles of management and industry cannot be overestimated and his ideas are still working for different corporations and manufactures around the world. "We hope you find this site useful for you. Let us know in case there is information missing or if you have suggestions to improve the content. We will appreciate your co-operation in the project.